Lovely cottage forming part of a beautiful 18th century School House which is set in 3 acres of mature gardens, with stunning panoramic views of the surrounding countryside. 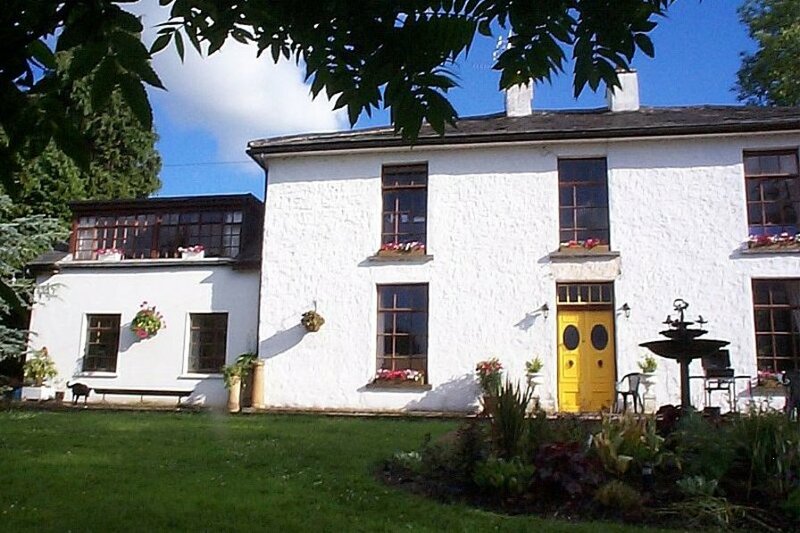 Perched on the hillside above the sleepy village of Kilmoganny this bright and sunny 18th Century School House, set in 3 acres, has a spiral staircase leading to the upstairs living area, taking full advantage of far reaching views across rich pastureland to the distant Slievenamon mountains. This 200 year old country retreat is centrally located and lies almost equidistant between the medieval capital Kilkenny with its magnificent castle, 14 miles away, and Ireland’s oldest city Waterford with its world famous crystal factory and golden beaches, 18 miles. The property is surrounded by mature trees and gardens thus making an ideal spot for a peaceful break as well as an excellent touring base for exploring the sunny south east of Ireland. A five minute walk takes you down to the local village Kilmoganny which has two shops, a takeaway and two pubs. The nearest larger towns are Callan, Carrick-on-Suir and Thomastown, all within a 10 minute drive. Only 15 miles from the picture postcard village of Inistioge ("Circle of Friends", "Widows Peak", etc.). It is situated only approximately 80 miles from Dublin, Cork and Shannon, each with an international airport. Waterford airport, with its daily flights to England, is a mere 40 minutes away whilst Rosslare Harbour is just over an hour's drive. Fishing is plentiful and readily available on the lovely river Nore, to name but one river in the area; horse riding is in abundance; lovely walks in the immediate vicinity; golf courses in locality including the famous Mount Juliet Golf Course in Thomastown; tennis available in the village; go-karting in Ballyhale; many historic sites including Kells Priory, Jerpoint Abbey, Dunmore Caves and Woodstock Gardens are all nearby. This 200 year old country retreat has a sprial staircase leading to the upstairs living area with open plan lounge, kitchen and dining area, taking full advantage of the stunning views. Bed linen provided free of charge (apart from cot linen). Cot, highchair and stairgate available. Full Oil central heating. Oil and Electricity is payable by meter reading.